y = dvbsapskmod(x,M,stdSuffix) performs APSK modulation on the input signal, x, in accordance with the digital video broadcast (DVB) standard identified by stdSuffix and the modulation order, M.
y = dvbsapskmod(x,M,stdSuffix,codeIDF) specifies the code identifier, codeIDF, to use when selecting the modulation parameters. y = dvbsapskmod(x,M,stdSuffix,codeIDF,frameLength) specifies codeIDF and frameLength to use when selecting the modulation parameters. y = dvbsapskmod(___,Name,Value) specifies options using one or more name-value pair arguments using any of the previous syntaxes. For example, 'OutputDataType','double' specifies the desired output data type as double. Specify name-value pair arguments after all other input arguments. 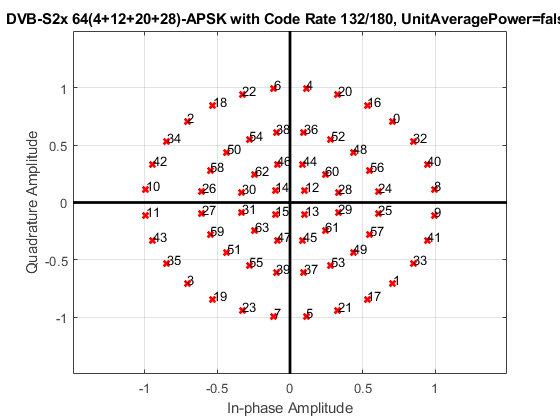 Modulate data using the DVB-S2X standard specified 32-APSK modulation scheme. 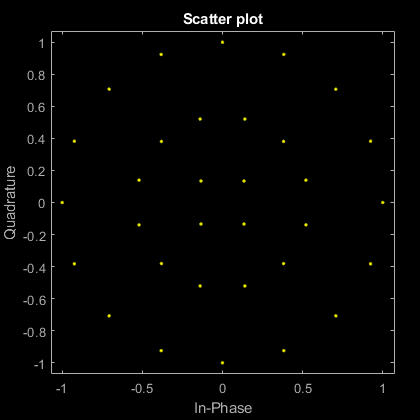 Display the result in a scatter plot. Set the modulation order and the suffix identifying the DVB-S2X standard. Create a data vector with all possible symbols. Display the constellation using a scatter plot. Modulate data using 64-APSK as specified in DVB-S2X standard. Plot constellation for different code identifiers. Set the modulation order and standard suffix. Generate 1000 symbols of random data in one channel. 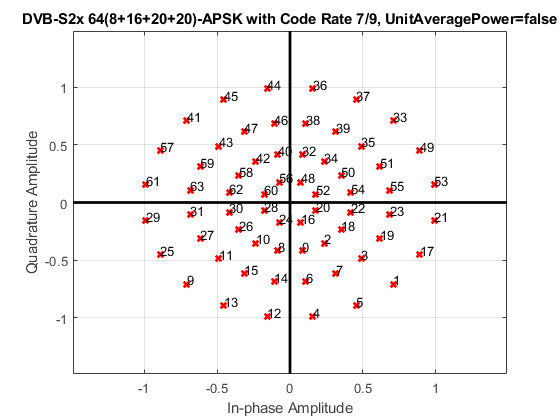 Modulate the data according to the 64-APSK constellation for the code identifier 7/9 and plot the reference constellation. Modulate setting the code identifier to 132/180 and observe the constellation structure differences. Modulate data using 16-APSK as specified in DVB-S2 standard for normal and short frame lengths. Compute the output signal power. Set the modulation order and the standard suffix. Generate random bit data for 1000 symbols in one channel. Set the input type to bit and modulate the data according to the 16-APSK constellation for code identifier 2/3. Use the default normal frame length. Modulate the data using different settings, set the code-identifier to 8/9 and use a short frame length. The average power of the modulated signal changes based on the code identifier. Compute the average power of the modulated signals. Modulate data applying 16-APSK as specified in the DVB-SH and DVB-S2 standards. Normalize the modulator output so that it has an average signal power of 1 W.
Set the modulation order and generate all possible symbols. Modulate the data applying 16-APSK as specified in DVB-SH. Use a name-value pair to specify single data type output. Modulate the data applying 16-APSK as specified in DVB-S2. Use a name-value pair to specify single data type output. Modulate the data applying 16-APSK as specified in DVB-S2. Use name-value pairs to set unit average power to true and to specify single data type output. Check which signals have unit average power. To process the input signal as binary elements, set 'InputType' value to 'bit'. For binary inputs, the number of rows must be an integer multiple of log2(M). A group of log2(M) bits in a column are mapped onto a symbol, with the first bit representing the MSB and the last bit representing the LSB. Standard suffix for DVBS modulation variant, specified as 's2', 's2x', or 'sh'. Code identifier, specified as a character vector or string. This table lists the acceptable codeIDF values. For more information, refer to Tables 9 and 10 in the DVB-S2 standard, , and Table 17a in the DVB-S2X standard, . This input argument applies only when stdSuffix is set to 's2' or 's2x'. Frame length, specified as 'normal' or 'short'. frameLength and codeIDF are used to determine the modulation parameters. Input type, specified as the comma-separated pair consisting of 'InputType' and either 'integer' or 'bit'. To use 'integer', the input signal must consist of integer values from 0 to (M – 1). To use 'bit', the input signal must contain binary values and the number of rows must be an integer multiple of log2(M). Unit average power flag, specified as the comma-separated pair consisting of 'UnitAveragePower' and a logical scalar. When this flag is true, the function scales the constellation to an average power of 1 watt referenced to 1 ohm. When this flag is false, the function scales the constellation based on specifications in the relevant standard, as described in  and . When stdSuffix is set to 'sh', the constellation always has unit average power. This name-value pair argument applies only when stdSuffix is set to 's2' or 's2x'. Modulated signal, returned as a complex scalar, vector, or matrix. The dimensions of y depend on the specified 'InputType' value. Digital video broadcasting (DVB) standards specify S2, S2X, and SH standard-specific amplitude phase shift keying (APSK) modulation. For further information on the DVB-S2/S2X/SH standards, see specified in , , and , respectively.